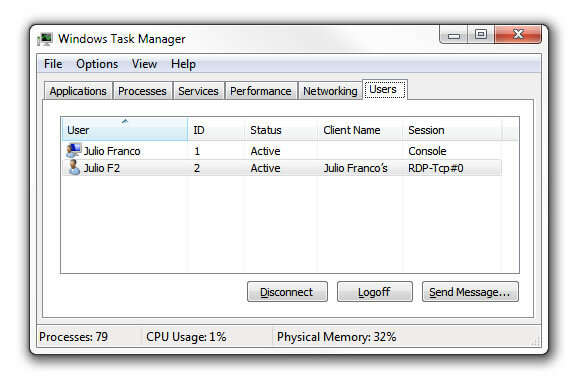 Want to share a computer with other users, concurrent Remote Desktop sessions will allow more than one person use that system under a different or even the same user account, without kicking each other off. 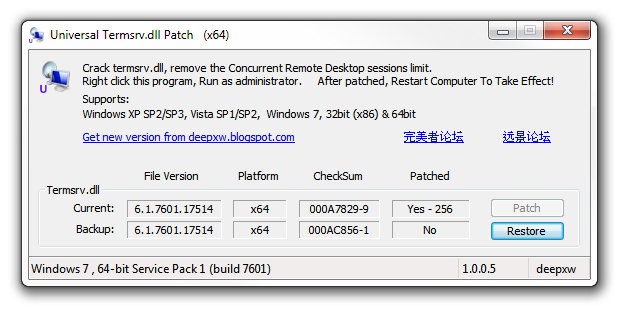 By patching a file called termsrv.dll, located in %SystemRoot%System32, this is possible in all editions of Windows 7, Windows Vista and Windows XP. Fortunately for us, Internet user DeepXW already did all the dirty work a while ago and posted his Universal Termsrv.dll Patch for anyone to get their hands on. Simply download and unzip the file, then run the corresponding file as administrator (right-click the exe file and select Run as Administrator). For 32-bit systems use UniversalTermsrvPatch-x86.exe and for 64-bit versions of Windows use UniversalTermsrvPatch-x64.exe. You should see a window like the one above where you can patch termsrv.dll to remove the Concurrent Remote Desktop sessions limit and restore the original file at any time (a backup file is located at 'windowssystem32termsrv.dll.backup'). After applying the patch, restart your system and you are ready to go. To test it out simply leave a session open on to the PC where you applied the patch, then from another machine try and connect to the computer remotely. If all goes well both users will be logged on and active.